Traditionally, the Gold Coast is known as the best place for a night out in Australia, with pumping nightclubs and a thriving pub culture; but a new wave of nightlife options centred on craft beers and trendy cocktail bars is emerging and proving that the nightlife on the Goldie can be both fun and classy. 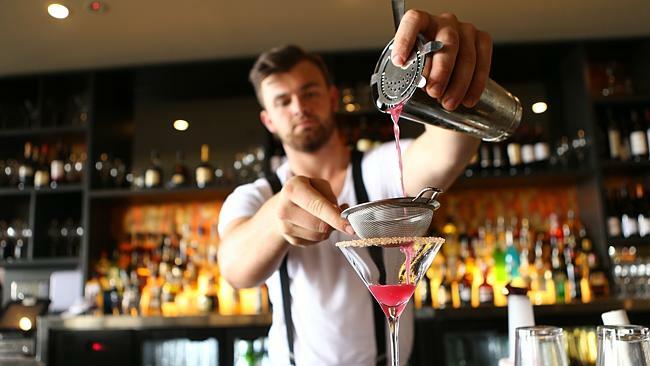 Below you’ll find just six of the best bars on the Gold Coast and why you should visit each. Located along The Esplanade at the base of the Soul complex, Elston combines a beachfront space with rustic garden feel. A little dark and moody but with plenty happening and the distant undertones of waves crashing and pop music. No trip to Elston is complete without trying their signature cocktails. Your lips will tingle as you take a sip of the Poprocktini (pictured below), a sweet passionfruit, peach and apple vodka based drink in a martini glass rimmed with crushed Poprocks. For something a little more masculine, the Jim Jarmushch Old Fashioned is another favourite that combines the flavours of coffee and cigars with Cuban cigar-infused spiced rum and coffee liqueur. For the bacon lovers, there is a Bacon-Infused Bloody Mary on the menu, combining Bacon-infused vodka, Worcester, lemon and tomato juice. With over 80 Australian craft beers on tap, there’s a beer – or cider – for every taste at Bine Bar. Named for the stem that hops grow on has eight rotating taps showcasing local labels such as Fat Yak, Newstead Brewing company, Green Beacon, Moo Brew, and Feral Brewing company. Bine considered Australia’s first craft beer bar and restaurant gives visitors a variety of ways to sample the brews. Sample paddles offer four beers in 177ml glasses up to 500ml glasses. Not a big beer drinker? Bine is still likely to have something for you. From gluten-free beers, ciders and fruit beers, cocktails and mocktails. Being in the rum state of Australia, Bine also has an extensive ‘Rum Baby Rum’ menu with over 30 options of the sugarcane distillate on the menu. A nondescript double-panelled door on the edge of the Gold Coast Highway is a entrance to one of the Gold Coast’s quirkiest bars. The Cambus Wallace is a nautical themed bar with a focus on quality whisky and rum. The bar’s name comes from a local shipwreck; The Cambus Wallace ran aground on nearby Stradbroke Island whilst carrying a supply of whisky and beer from Scotland. Come early to enjoy the spoils from the kitchen, with The Captain’s Table cheeseboard a favourite, featuring a range of Australian cheeses or the Serrano Bodega Ham & Porchetta Share Plate being among the best value in town – the perfect accompaniment to any of The Cambus Wallace’s great drinks. Their cocktail menu is in keeping with the nautical theme. The menu includes Sailor’s Tonic, Siren’s Kiss, The Maiden Voyage #2 and The Kraken Espresso Martini. House favourites include the Rhubarb Daiquiri (Angostura rum, Sailor Jerry, Aperol, rhubarb bitters, lemon & lime juice, mint and simple syrup) which is a cocktail that will divide drinkers with its strong flavours and the fresh flavours of the Pepé Lé Cue (Hendricks gin, elderflower liqueur, lemon juice, peppermint tea syrup and cucumber). For the adventurous, try one of the eight themed rum or whisky flights to sample an array of the drinks stocked. The QT Hotel is known as one of the coolest hotels on the Gold Coast and so it’s not surprising that their lounge is a hit with both visitors and locals alike. With a chic industrial vibe and Mexican flair, it’s the perfect to let your hair down and dance the night away. It’s no surprise that the drink of choice is tequila. The spirit has a bit of a bad reputation, but Stingray Bar & Lounge wants to educate drinkers that not all tequila needs to be taken with a side of salt and lime. Weekly ‘Tequila Thursday’ classes showcase the diversity of flavours fine-aged tequila can impart on a drinker. There are tastings of tequilas, including Herradura Plata, Anejo, and Reposado, tips on how to choose the best tequila for different purposes like mixing cocktails or sipping; and how to tell the good from the average. If you can’t make it to Tequila Thursday, head to the lounge any night to try their impressive collection of tequilas or their Skinny Cocktails. A healthier option than standard drinks, the selection of cocktails is made using low-calorie agave nectar. Top choices are the sweet and fruity Skinny Pash ( pictured above) (Eristoff vodka, passionfruit, Aperol, pineapple, lime, agave) or the more demure Skinny Gin Lady (Lemongrass infused Bombay Sapphire, lime, agave, egg white, mint bitters). Best for cocktails with an Italian flair! This is not your average pizza restaurant! Justin Lane has to be among the most popular spots in Burleigh Heads for those looking for casual class, great food, and lively atmosphere. What’s even better is enjoying it all from their new rooftop bar which gorgeous views of the beach. Check out the deep flavours of Justin’s Barrel Aged Cocktail (Bacardi 8 year, cynar and elderflower mix that barrel aged for 14 days). The Blueberry & Pomegranate Collins on Tap (Zubrowka vodka, Cointreau, passion fruit, lemon, lemonade, mint) is a refreshing crowd pleaser on a warm Gold Coast night and can be served by the glass or jug. Get a bunch of friends together, order some pizzas and drinks and let the good times roll! Don’t be fooled by the location, Bin 72 may be located in the Strand shopping centre, but the casual bar’s first-floor location is anything but average. It’s all about that beach view with floor-to-ceiling windows and reclaimed beach wood tables which give a sophisticated but relaxed vibe. The house special is the Guava Jalapeno Margarita, a spicy little number served with a chilli salt rim, kick of lime and a little spice. For those not ready to feel the heat, there’s a selection of martini’s on offer, including an espresso “MANtini” which swaps vodka for whisky, and plenty of great local and international wine. Have you been to any of these bars? Any I should add to the list? I was invited to the Gold Coast as a guest of Visit Gold Coast. All thoughts, opinions and cocktails consumed are, as always, my own. Bush Tucker: A Taste of the Outback + a chance to WIN! I’m suddenly thirsty 😉 Great post, thanks for sharing! Hi Lauren, Thanks for commenting! Which of the bars drinks were you thirsty to try? My friend is a big fan of Justin Lane which holds a breathtaking view! Unfortunately I didn’t get a chance to visit it. But glad to see a familiar name on your list. The Justin Lane & Cavalier Bar one sounds really tempting!